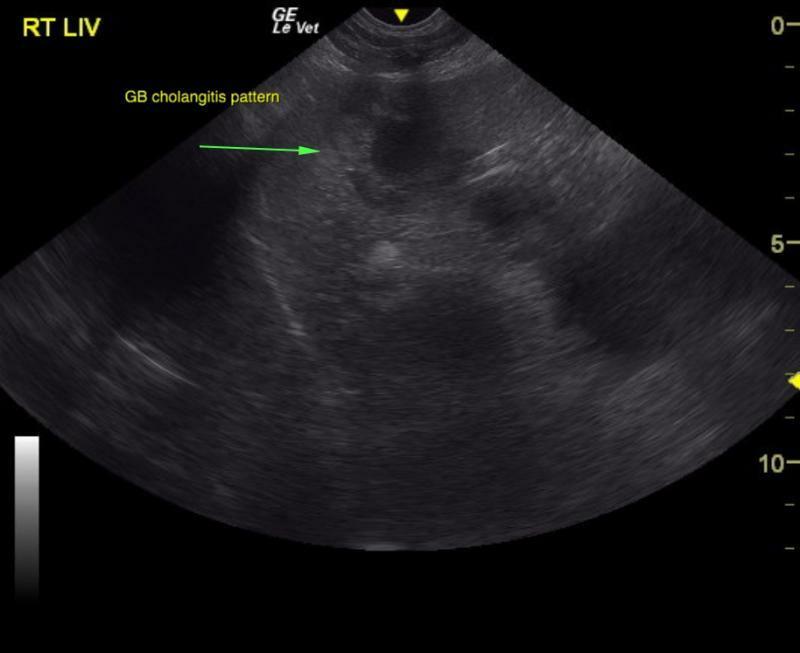 Gallbladder cholangitis pattern. Note the hypoechoic parenchyma with inflammatory pattern (arrow) and double layered gallbladder wall. 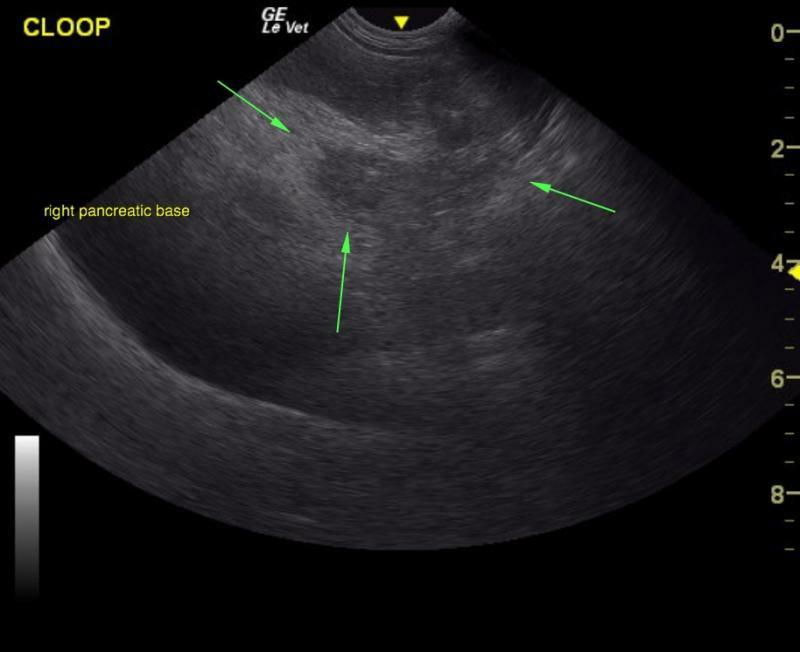 Minor heterogenous changes in the right pancreatic base and hyperechoic periserosal inflammatory pattern (arrows) indicative of pancreatitis. Mildly increased cortical thickening indicative of mild interstitial nephrosis pattern. Note the free fluid surrounding the caudal aspect of the kidney in the near field. Normal left adrenal gland just cranial to the left renal artery. Normal right adrenal gland superimposed over the vena cava. Thickened, edematous gall bladder wall. Normal common bile duct positioned above normal portal vein. Note fluid-filled stomach upper right. The spleen was volume contracted. 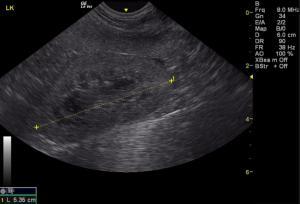 The liver was swollen and hypoechoic with a double layered gallbladder. The stomach presented fluid accumulation. The small intestine was unremarkable. There was no evidence of a foreign body. The pancreas was largely uniform with minor, heterogenous changes noted in the right limb. This is consistent with pancreatitis. 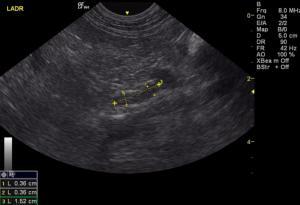 Surrounding free fluid was noted in the abdomen. Rapid view of the heart revealed volume contraction and shocky contractility. Acute hepatitis/cholangitis pattern. Free fluid, potentially owing to neoplasia or portal hypertension. 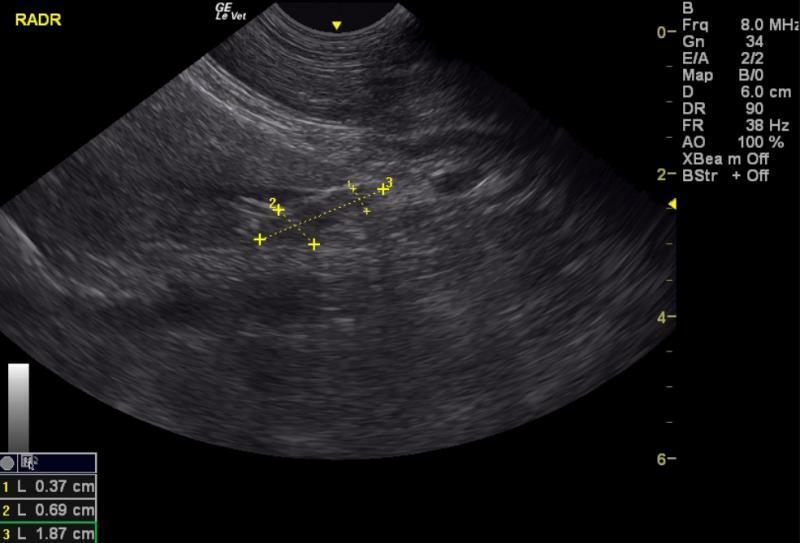 Based on the ultrasound results, treatment for gastritis, cholangiohepatitis and pancreatitis would be recommended in this patient. Leptospirosis or toxin exposure is possible. Plasma expander +/- plasma transfusion would be ideal. No complication to FNA was noted. Volume contracted heart with shocky contractility. Very guarded prognosis depending upon underlying cause. Ultrasound-guided FNA of the liver was performed without complication. Cytology results: Mild vacuolar degeneration with suggested regeneration Comment: The mild vacuolar change noted could be associated with a toxic event as suggested. No evidence of underlying disease was detected and overt inflammation was not observed. Acute hepatitis/cholangitis pattern. Free fluid, potentially owing to neoplasia or portal hypertension. On subsequent referral to Oregon State University, it was determined that the patient did indeed suffer from mushroom toxicity (specifically, one of the genus Amanita, which were found in the patient's backyard and appeared to be partially eaten). Treatment consisted of supportive care and reducing neurotoxins produced in the GI tract. The patient's treatment plan included Denamarin, Lactulose, Cerenia and Omeprazole and a diet of Hill's L/D. Repeated chemistry panel on 10/29/15 and again on 11/23/15 showed progressive decreases in the levels of BUN, GGT and ALKP until normals were attained. 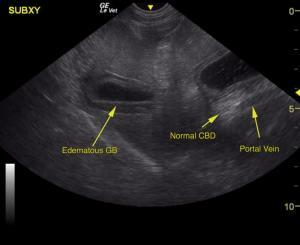 Left liver view with double layered edematous gall bladder wall, normal common bile duct and normal portal vein. Minor free fluid. 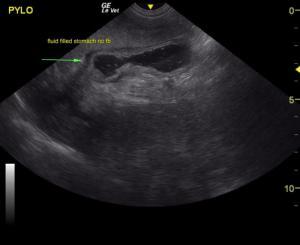 Free fluid surrounding a swollen, hypoechoic liver with edematous gall bladder. Fluid filled stomach indicative of gastric ileus and trace free fluid upper left. Swollen liver, free fluid and increased portal markings. Normal pylorus. Volume contracted heart with shock-type contractility. Normal heart structure from this obliqued short axis view.